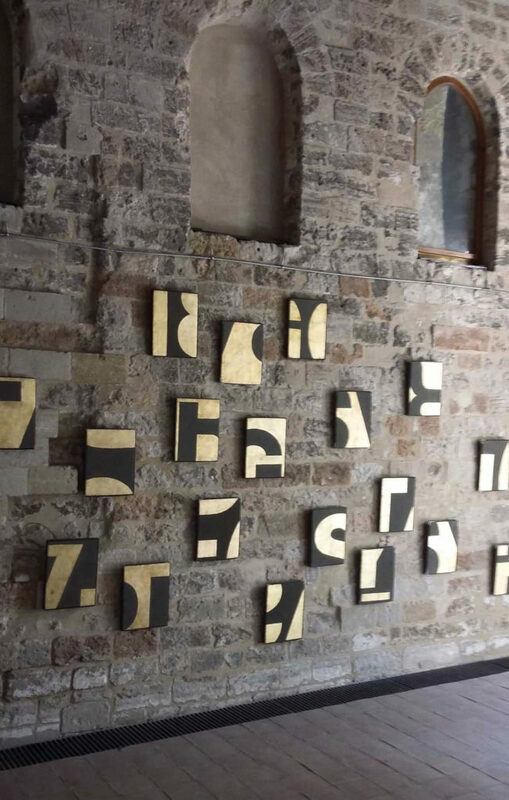 The range of colours is limited to just two: a very dark green for the almost-black background, and gold for the words of the text flowing across twenty-seven canvases, hung not in a line but in a pattern that recalls a musical score. At first glance, the text seems unfathomable, but as the title suggests, it is a fragment of a mantra of Vedic tradition. The text is a threshold to cross, an enigma to decipher in order to reveal its content of truth. Mantra is part of a cycle of compositions the artist has been working on since 2017. They all fall within the same province: a spiritual tension, a questioning of the sense of our being in the world in this historical period of radical transformations. The sense of these works that refer to different religious traditions lies in their quest for a common core, able to preserve us from hate and intolerance. The message contained in Mantra goes in this direction, but not only. The artist’s formal choices are in themselves a declaration of intent: the drastic reduction in figurative elements as well as the gold and the dark green make this work an object of meditation with a contemporary slant and with an implicit reference – also via Malevich’s Black Square – to the icon and its theological as well as artistic significance, its being a ‘presence’ and not just a simple artistic depiction.